As a celebration of thirty years of STi, Subaru introduces its 2019 WRX STi Diamond Edition, a halo model in its performance car line-up. Developed by the technical team at Subaru Southern Africa, the Diamond Edition is exclusive to the region and only thirty numbered vehicles will be sold. There’s a powerful and nostalgic heritage behind the name of the motorsports and performance subsidiary of Subaru Corporation, Subaru Tecnica International. STi. Three letters that have commanded the respect and passion of performance car enthusiasts for three decades. In thirty years, these three letters have adorned the racing lapels of motorsport royalty, dominated the world stage of rally and circuit racing and carved out a reputation for slaying the most venerated competition. Officially registered in April 1988, STi made headlines from the very beginning, breaking the World Speed Endurance record in a 164kW Legacy RS RA. The car completed 100 000km over 20 days at an average speed of 223km/h. In 1993, Subaru debuted a new blue and yellow Legacy RS race car driven by Scotsman, Colin McCrae who piloted his car to a first victory for the team at the New Zealand rally. In 1994, STI signed WRC Champion Carlos Sainz to the team and together with McCrae, became the team to watch that season. Subaru placed second overall in the 1994 World Rally Championship with Sainz placing second in the drivers’ standings and Colin McCrae fourth. From 1995 to 1997, Subaru dominated the WRC winning the constructors’ championships for three years in succession, making world champions of Colin McCrae and Tommi Makinen in the process. It was a hat-trick of victories that cemented the signature Subaru STi World Rally Blue hue and rumbling sound into the minds of fans the world over. Having achieved so much in rallying, STi officially withdrew from the World Rally stage in 2008 and instead focused on endurance racing. In 2008, it entered a WRX STI in Germany's 24 Hours of the Nurburgring. The narrative reads very similar to the WRC story – STi has dominated the SP3T class in which it competes, winning in 2011, 2012, 2015, 2016 and 2018, often in the most treacherous wet weather. In just 30 years, STi has crowned Subaru with 3 Constructors World Rally Championship titles, 3 World Rally Championship Driver’s titles, 47 World Rally Championship overall wins and 5 class wins in Germany’s 24-Hour Nürburgring races. This excludes the myriad championship victories by Subaru works teams in regional rally exploits in Canada, America and Australia. Apart from these, there are numerous land speed and production car record honours including the famous 2016 Isle of Man lap record as well as the 2018 record 40-minute 58.8 second speed run of the infamous Transfagara an Highway in Romania. Both of these feats were completed by veteran rally ace Mark Higgins in specially prepped WRX STi’s. In anticipation of 2018 marking the thirtieth anniversary of STi, Subaru Southern Africa embarked on a development project to produce a more powerful version of the iconic performance sedan. It was a project that followed yet another undertaking of a similar nature just 14 years ago when the STImulating Edition STi was launched in South Africa only. In 2004, Subaru SA delivered 15 special edition versions of the Impreza WRX STi. Based on the standard model, the limited-edition STimulating STi developed 195kW of power and 343Nm of torque. These cars were a celebration of 15-years of STi and they have become collectors’ items. The Diamond Edition follows the same tradition – a limited-run project of just 30 unique vehicles as an ode to 30-years of STi. The project was spearheaded by the Subaru Southern Africa (SSA) Team and led by Technical Manager of Subaru SA, Deon Van Heerden and the objectives were clear. He said: "We needed to get STI reborn and create a vehicle that was more powerful and something that would become a talking point for STi fans." The first development mule arrived in December 2016 and official Diamond Edition performance development started in January 2017. It took 18-months to develop the car to a point where Subaru SA was entirely happy with the results and the outcome. It was a process of substantial durability and wear testing, oil testing and dyno tuning. Whilst the technical department was responsible for the performance enhancement, they were also involved in the design process to create a car that not only performed more aggressively but also looked more appealing and would gain a unique styling edge. Compared to the standard WRX STi, the Diamond Edition strikes a more aggressive stance and features stand-out elements. Making use of spacers on all wheels, the car sits 20mm wider than the standard car. Another key identifier of the Diamond Edition is an all-round body kit finished in the same High Viz yellow hue that adorns the Brembo brake calipers. The kit lowers the car by 10mm at the front adding to the sportier stance and gives the Diamond Edition a unique, stand-out presence. Upon each vane of the spoiler kit, sits a small yet distinct stainless steel STi badge – another unique identifier of the Diamond Edition that is complemented by the high gloss black 30 Diamond Edition badges on the sides of the rear wing. 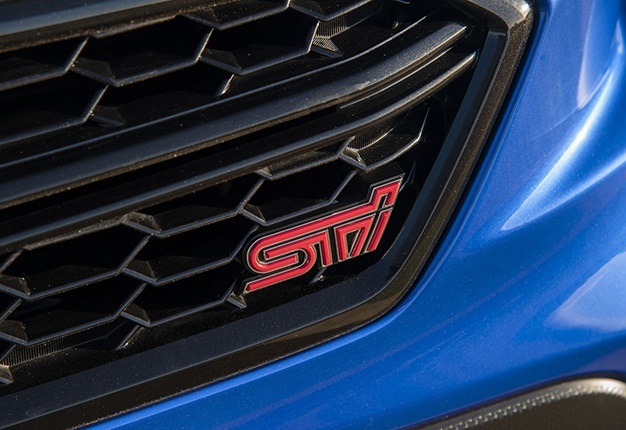 The signature STi features remain unchanged: The hawk-eye LED Daytime Running Lights; the large bonnet intercooler scoop at the front and rear spoiler. The STI is fitted with 19-inch 245/35 R19 rubber on darkened, lightweight, aluminium Y-design alloys. Also, new on the MY2019 WRX STi are rear fog lamps for added visibility in poor conditions. The WRX STi Diamond Edition also features a 7-speaker, 440W Harmon Kardon power speaker system. The 7.0" Touch Screen Infotainment System with 6-speaker CD and Bluetooth hands-free functionality now incorporates updated Apple CarPlay and Android Auto applications too. These mirror the user's phone interface and allows a better user-experience and safer driving. The main objective in creating the WRX STi Diamond Edition was to increase the power and performance of the vehicle but also to ensure the car remained a pleasure to drive on a daily basis. This is the essence of Confidence in Motion. Deon Van Heerden says this was a key focus. "We definitely wanted to achieve more power but not to a point where the vehicle became unpleasant to drive or too highly strung. I think we’ve achieved just that," he says. "We’ve managed to develop the fastest and most powerful production STi ever released in South Africa and I am very proud of our team." Deon Van Heerden’s mission has been accomplished. The increase in power has been achieved through a remapping of the car’s Electronic Control Unit and the fitment of a performance exhaust system. The 2.5 litre, high-boost turbocharged Boxer engine’s power is now a feisty 260kW at 4 500rpm and doles out 464Nm of torque at 4 000rpm. Top speed remains 255km/h but the 0 – 100km/h has been significantly shortened. 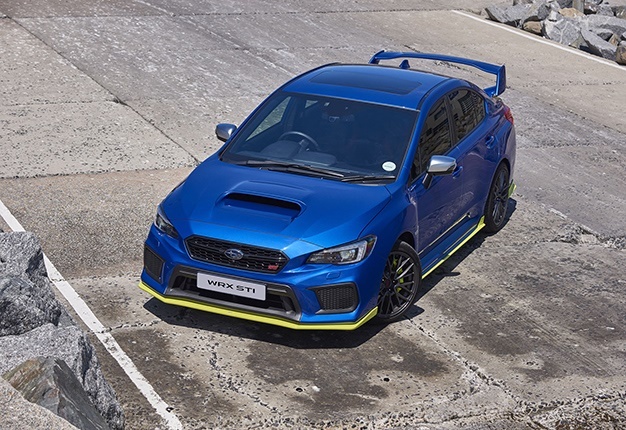 Tested in Gauteng at an altitude of 1 410m above sea level, the Diamond Edition achieved a 5 second 0 – 100km/h time, 0.7 seconds quicker than its standard WRX STi sibling under the same conditions. The 0 – 160km/h time has also been exceeded by more than 1-second with the Diamond Edition posting a 13.7 second time and the standard vehicle posting a 14.7 second time. Handling on the WRX STi is courtesy of a Subaru’s famous Symmetrical All-Wheel Drive system coupled with an electronic multi-mode Driver Controlled Centre Differential (DCCD). The electrically-assisted quick ratio steering wheel is weighted to the sporty nature. This enables the car to stick to the road with poise and confidence at high speed under varied road surfaces. The entire driving experience of the WRX STi is for the purist driver – mechanical, visceral, raw and powerful. The signature Subaru rumble on the WRX STi has been enhanced. The power is delivered through a longer and lower torque curve, the steering is sporty, and the six-speed manual transmission feels perfectly firm and mechanical, adding to the purist driver focus. It’s a driver’s car through and through. The MY2019 WRX STI Diamond Edition is a 5* safety achiever. In 2018, revisions to the front chassis structure were made for improved safety in frontal collisions. The Diamond Edition STi is fitted with Active Torque Vectoring, Subaru Vehicle Dynamics Control and seven airbags including a driver’s knee airbag. The front seats have been designed to reduce whiplash, the side doors contain reinforcement beams and the cars feature a brake pedal safety system that reduces the risk of damage to the legs in a collision. Coupled with the safety that Symmetrical All-Wheel Drive and Boxer engine technology brings, the WRX STi is a pure example of safety and performance. Pricing is set at R799 000 inclusive of a 3-year or 75 000km Full Maintenance Plan and a 5-year or 150 000km warranty.